Neighborhood Watch is undoubtedly one of the oldest and most well-known crime prevention programs in history. While the modern day concept of program rose to prominence in the late 1960s in response to an increasing burglary rate, the roots of Neighborhood Watch can actually be traced all the way back to the days of Colonial settlements, when night watchmen patrolled the streets. The modern version of the Neighborhood Watch-USAonWatch Program was developed as a result of the multiple requests from sheriffs and police chiefs around the country who were looking for a crime prevention program that would incorporate citizen involvement and address the increasing number of burglaries taking place, especially in rural and suburban areas. In 1972, the National Sheriffs' Association (NSA) took the concept a step further by seeking funding to make the program a national initiative. Thanks to a grant from the Law Enforcement Assistance Administration, the National Neighborhood Watch Program was started. For the first two years, the program was devoted primarily to disseminating information on the nature and volume of burglary and securing residential property and making it less vulnerable to break-ins. From there, it evolved into a program that promoted the establishment of ongoing local neighborhood watch groups that encouraged citizens to partner with their law enforcement agencies in an effort to reduce various types of "neighborhood crime." 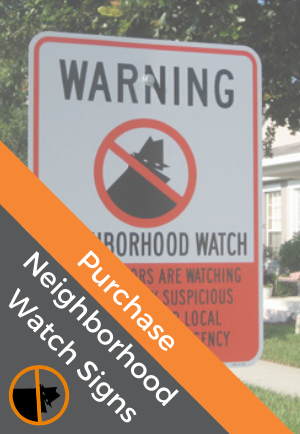 Since its beginnings, Neighborhood Watch has grown from an "extra eyes and ears" approach to crime prevention to a much more proactive, community-oriented endeavor providing a unique infrastructure that brings together local officials, law enforcement, and citizens for the protection of their communities. Today's Watch Group programs incorporate activities that not only address crime prevention issues, but also restore pride and unity to a neighborhood. It is not uncommon to see members of Neighborhood Watch groups participating in community cleanups and other activities that strive to improve the quality of life for community residents. In addition, the adoption of community policing by local law enforcement agencies has contributed to a resurgence in Watch groups over the years. Neighborhood Watch fits nicely into the framework of law enforcement/community partnerships, and Neighborhood Watch meetings provide a useful forum for airing neighborhood problems and practicing problem-solving techniques. As communities throughout the country have adopted the program and reported success, the popularity of the Neighborhood Watch Program has grown, and it continues to still.